Are ya Havin’ a Happy Wednesday? What am I gonna write about? It’s already Wednesday and I have nothing to write about…….. I am pretty sure no one wants to hear about my grouchy kids, their insane amount of homework, or the fact that the ground is STILL covered in snow. No one wants to read about how I cleaned out my refrigerator, what we had for dinner last night, or that I stepped in syrup this morning and tracked in all over the kitchen (with bare feet). No one really wants to see me write about how it’s only Wednesday and I feel like the weekend was forever ago, that I am sick to death of my stuffy nose, or how the dogs are making me crazy. I also cannot figure out what to make for dinner tonight, whether or not it’s worth the tired kids to go to church this week, or if we should have small group this weekend; because I really need to let people know! There is just so much whining in my house this week; myself included (obviously)! So far this week I am having to make a very deliberate choice to be happy, because my little world feels kinda down. Has your week been kinda whiny too? Maybe your daughter had a meltdown this morning because you didn’t have any bagels! Maybe you cannot stop dropping things and finally dropped a glass full of milk. And as it shattered all over the floor you just wanted to cry (or crawl back in bed, because both seemed like better options than facing the day ahead)! I know it could be a lot worse. What am I saying, I’ve seen it a lot worse! It IS a lot worse for many of my friends; especially this week! Maybe that’s why everything feels so much heavier than it actually is? So, I’ll choose to find joy Olivia’s laugh, even though she was the one who had the meltdown (that’s right it was about bagels). I can definitely find it in the amazing guacamole and chips Clint brought me after he heard about my morning (I love him so much). I’ll choose to see happy in Belle’s beautiful hazel eye’s while she tells me about her reading group (for the thousandth time). And Jaden will help me find it as he tells me about the guest teacher he has in Social Studies, who always seems to say the wrong thing to a large group of 7th grade boys (you can only imagine). 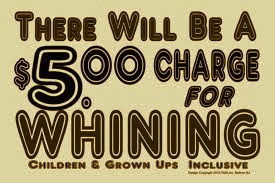 Tell me about your whiny day and how you are gonna find the happy in it! Or don’t and just listen to me vent. Either way I hope we can all find a way to look past the little things that make us want to spend our time whining!